HAAS VF-2B CNC VMC, 20HP 2 SPEED GEAR DRIVE, CT-40, 20 ATC,S/N 45580. HAAS SL-20T CNC TURNING CENTER, TAIL STOCK, TOOL PRESETTER, 20HP VECTOR DRIVE, 8’’ CAPACITY CHUCK, CHICK AUGER, S/N 71179. 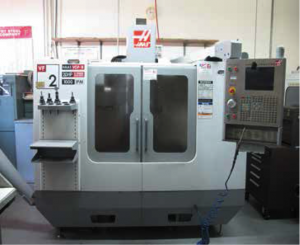 HAAS 4 TH AXIS INDEX WITH TAIL STOCK. 1999 BROWN AND SHARPE GAGE 2000 CMM, PROBE, S/N 1199-1768. SUNNEN MBB-1660 HONING MACHINE WITH STROKER, S/N 88129. MITUTOYO TYPE PJ-300 12’’ OPTICAL COMPARATOR, WITH MITUTOYO DIGITAL DIALS. LARGE SELECTION OF DRILL INDEX.LARGE SELECTION OF END MILLS, CARBIDE TOOLING, CUTTING TOOLS, BORING TOOLS, TOOL BOXES, PIN GAGES, SUPPORT TOOLS, AND BENCHES. LARGE SELECTION OF CT-40 TOOL HOLDERS.